Can President Bush change the balance of power? 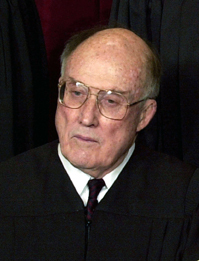 For the past 18 years, Chief Justice William H. Rehnquist has led a Supreme Court with a tenuous conservative majority and a cohesive liberal bloc. Now battling cancer, Rehnquist is widely expected to retire soon, perhaps before the end of the court's current term this summer. That would allow President Bush to put his stamp on the court, which has had no vacancies for more than 10 years. Other justices are nearing the end of their tenure also, including the court's most liberal member, John Paul Stevens. Bush has promised to nominate conservative jurists to the court, which could touch off fierce confirmation fights in the closely divided Senate. Republicans are already angry with Democrats' tactics in blocking votes on Bush nominees for lower courts. Meanwhile, the court's calendar includes controversial cases to be decided soon on the death penalty, church-state relations and property rights.